Which is good, because Bubbles is super-excited about her party. She asks every morning if it’s her birthday yet, rattles off the guest list, and asks about her Disney Planes cake. She also has invited pretty much everyone at any store we’ve been to in the past two weeks. One of the first ideas I had for party treats was cotton candy. 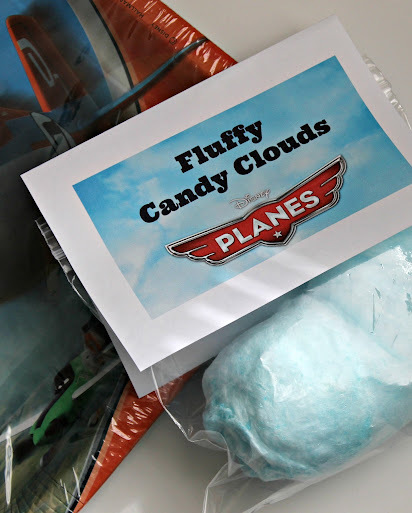 It’s a fun treat for kids and it’s so soft and fluffy – just like a cloud. I thought they’d be the perfect match for a Planes party. I made the cotton candy myself with the cotton candy maker our friends at Nostalgia sent us. I love it because all you need are a few hard candies (I used Jolly Ranchers) and you can make them any color you want (plus you can do sugar-free!). 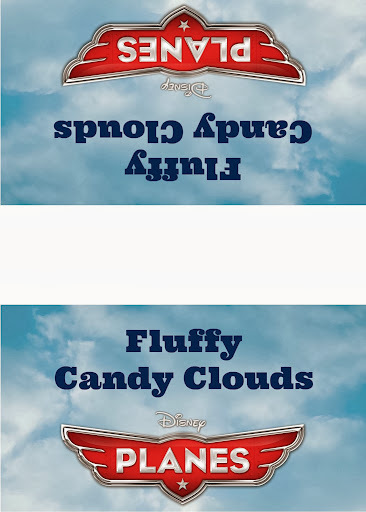 Click the image below for a printable .pdf version of the “Fluffy Candy Clouds” labels. Fold them in half over the bags of cotton candy and tape or staple closed (I used double-sided tape because I don’t like staples around young kiddos if possible). I also created a couple of signs for our party table. 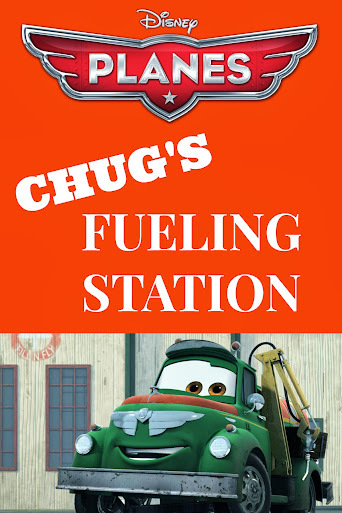 The first one will be set next to the drinks and reads “Chug’s Fueling Station” (Chug is the fuel truck in the Planes movie). The second one will be placed near the snacks and reads “In-Flight Snacks” so our guests can grab-and-go and not miss a minute of the “in-flight entertainment”. Click each image below for a printable .pdf version. 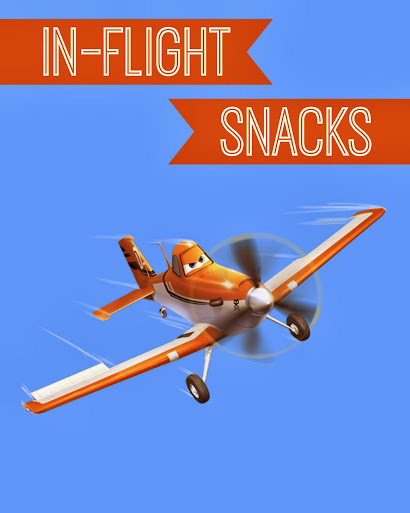 Keep an eye out this week for more printables and Disney Planes party ideas. I have a few more things I’ll be sharing! Then next week you’ll be able to see photos of the entire party setup. 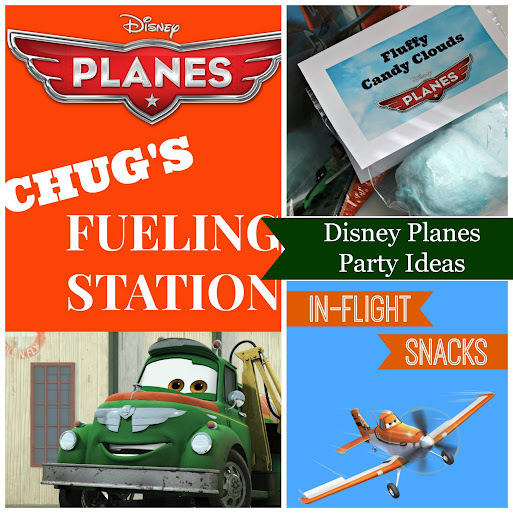 What’s your favorite Disney Planes party ideas? Yeah, hehe it is cliche, but it’s true! These are so cool and clever! I am planning a Doctor Who party for my almost 7 year old! Sometimes you look at your little ones and want to cry b/c they are so big. I love your cloud idea! What a cute party favor. Adorable!! What great ideas for a birthday party! Oh my goodness, what fun. Love the printable, as well! Oh those are such cute printables! They would be perfect for a kids b-day party or just a fun friend get together! Cute printables, thank you for sharing! I am looking forward to seeing the post party pics. Love the printable! What a cute idea and such awesome printables. LOVE THEM. My little one would love this as theme. Those are so cute! I bet this party is going to be a smashing success. There is nothing like having cotton candy clouds any day. I love this! Cute ideas and you can’t go wrong with Planes. They do grow fast! Mine are 17 and 19. It seems like just yesterday I was planning fun things like this! Awesome ideas by the way and I love cotton candy. So cute! Great ideas and can’t wait to see this one! Great ideas for a party! I haven’t seen Planes yet but look forward to it! That will be a fun party! Cotton candy is perfect for clouds. These are adorable! My son would love them and what kid doesn’t love cotton candy? Can’t wait to see the entire party! What great printables! I know a few kids who would love to receive these. I love how you tied those into party snacks. REally cute ideas here and I love the cotton candy one. These are such cute ideas. I love the fueling stations idea. Seriously so cute! I love the cotton candy! Makes me want to have a Planes party! I LOVE the blue cotton candy/cloud idea. What a cute theme for a party! These are adorable and so creative! Great job! Hey Liza, picked a lot on your party ideas. Thanks a lot for these printables. Kids really love Disney characters that’s why their the most requested party themes. Love that fluffy clouds!.